Birthplace : Elmira, New York, U.S.
On February 4, 1995, at 12:22 a.m. in Cape Canaveral, Florida, thousands of people held their breath as Lieutenant Colonel Eileen Collins launched the U.S. Space Shuttle Discovery into the heavens on her first mission as pilot. Flames burst from the shuttle's engines as smoke enveloped the launch pad. During the shuttle's violent ascent, acceleration is so forceful that the astronauts are pinned against their seats and breathe with difficulty as G-forces pound against their chests. The shuttle approaches an escape velocity of 3,000 miles per hour and later accelerates to 17,500 miles per hour. From her position inside the craft, U.S. Air Force Lieutenant Colonel Eileen Collins handled the takeoff with extraordinary confidence. Perhaps piloting the shuttle seemed to be all in a day's work for Collins because she had rehearsed the takeoff hundreds of times in a simulator. She spent the previous month practicing takeoffs and landings for up to 14 hours per day and, during the previous six months, spent an average of three hours per day in the simulator. But the morning of February 4 was the real thing, and there was no room for error. Fear and excitement undoubtedly swelled in Collins as the price of failure was contemplated. Although Collins's trip was the Discovery's twentieth flight and the sixty-seventh for the shuttle program, the voyage was a special one for a few reasons. First, the Discovery made a history-making rendezvous with the Russian Mir space station. Second, Collins was the first female pilot ever to fly the shuttle. Nineteen other women have been astronauts, beginning with Sally Ride in 1983, and have performed research and made space walks and repairs, but Collins was the first to actually pilot the craft. Collins's responsibility for the flight included steering the space ship by firing small rockets, monitoring flight instruments, and handling the function of radar and navigation systems. Although the space shuttle was like no other aircraft she had ever been in, she mentioned in an interview with Ad Astra magazine before the launch, "I would say that every aircraft I have ever flown will have some transfer to flying the space shuttle." And Colonel Collins has flown many planes, logging over 4,000 hours in 30 different types of aircraft. With all the flying experience Collins has under her belt, it would seem that she has been flying all of her life, but in fact, she had never stepped into a plane until she was 19 years old. Since Collins's parents could not afford the flying lessons she longed to take, she took part-time jobs to save up the $1,000 she would need. Alan Davis, the retired air force pilot who trained her, told the New York Times, "She was very quick to pick it up. She was very quiet and very reserved, but also very determined and very methodical." Collins's flying lessons were a long awaited gift to herself. Since her childhood, she loved going to the airport with her parents and sitting on the hood of their car to watch planes take off as she drank root beer. They would also go to Harris Hill and watch gliders sail off cliffs while she told herself that one day she would be in the cockpit when one of those planes took off. As a teen, she read military books on flying, but she recalled even earlier memories of a love for flight. In fifth grade, she read an article on the pros and cons of the space program. "Even then, I couldn't understand why we shouldn't spend money on the space program," she told Ad Astra. Those were big dreams for a little girl born in the small town of Elmira, New York. Collins is the second of four children of James and Rose Marie Collins, who separated when she was nine years old. Part of Collins's childhood was subsequently spent in public housing, living on food stamps. Apparently, in school, she made a favorable impression on her teachers. Her high school chemistry instructor still remembers exactly where she sat in his class. He told the New York Times, "Second seat, second row," pointing to a picture of a shy, long-haired girl in a yearbook. Collins graduated from Elmira Free Academy in 1974 and registered at Coming Community College. She received her associate's degree in math two years later and had intentions of being a math teacher. She also went on to receive a bachelor of arts in math and economics from Syracuse University. Some interesting things, however, were happening elsewhere in the world. In the same year she graduated from high school, the U.S. Navy accepted its first female pilots. Two years later, the U.S. Air Force accepted their first female pilots. And in 1978, they chose four female applicants from the 120 who applied for Air Force Undergraduate Pilot Training. One of the accepted applicants was Collins. Also in 1978, the National Aeronautics and Space Administration (NASA) began accepting women into the space program. Ironically, the first female astronauts did their parachute training at Vance Air Force Base in Oklahoma at the same time Collins was there for air force training. Although always intrigued with space, it was the first time Collins realized that being an astronaut was possible. She later credited the other female astronauts who have gone before her. She told Ad Astra, "The fact that women have been in the NASA program since 1978 has helped me assimilate to the program. The first female astronauts were so excellent that it really paved the way for the future of women." Nevertheless, Collins felt there was tremendous pressure on her and commented in the New York Times, "I realize I can't afford to fail because I would be hurting other women's chances of being a pilot." After graduating from pilot training in 1979 at the age of 23, Collins became the first female flight instructor. From 1979 to 1990, she taught in Oklahoma, California, and Colorado. In addition to giving soldiers flying lessons, she was also a math instructor at the U.S. Air Force Academy in Colorado Springs. A student as well as a teacher, she took pilot training classes at the Air Force Institute of Technology and, at age 32, was the second woman ever to attend Air Force Test Pilot School. Collins also received a master of science degree in operations research from Stanford University in 1986 and a master of arts degree in space systems management from Webster University in 1989. Then, in January of 1990, NASA selected Collins to become an astronaut. According to NASA biographical data, she was initially assigned to Orbiter systems support. She also served on the astronaut support team responsible for Orbiter prelaunch checkout, final launch configuration, crew ingress/egress, and landing/recovery, and as a spacecraft communicator (CAPCOM). She was later, of course, made space shuttle pilot for the Mir space station rendezvous flight in February of 1995. The Mir space station is an artificial Russian satellite designed to revolve in a fixed orbit and serve as a base for scientific observation and experimentation. Eventually, the Mir will be permanently occupied, and space shuttles will transport astronauts to and from the station. This mission of February 4, 1995, was a dry run to lay the groundwork for an actual landing scheduled for the summer of that year. Collins explained the mission to a reporter in Ad Astra: "The best comparison to what we are going to do is the Apollo 10 mission that descended to within 15 kilometers of the lunar surface, and the Apollo 11 mission that landed on the Moon." The rendezvous continued a trend of international cooperation between Russia and the United States. Space exploration has also strengthened relationships between other nations, including Canada, Japan, and European countries. A change in the Spacehab module that the shuttle would be carrying into orbit caused a postponing of the launch, which was originally scheduled for May of 1994. Although the nine-month delay was frustrating, Collins took the extra time to learn the Russian language and familiarize herself with the Mir. Then, just before the next scheduled flight, there was a failure in one of the three navigation units required to control the shuttle's steering. Engineers worked around the clock, and NASA delayed the trip another 24 hours. When the launch finally took place, the astronauts discovered a minor propellant leak on one of the jet thrusters. Though the leak would be manageable, the Russian astronauts became worried about the Mir's exposure to damage by such a close encounter and rearranged the rendezvous for a safer 1,000 feet, instead of the scheduled 38 feet. NASA scientists negotiated with the Russians, reassuring them that their space station was in no danger. The Russians were eventually convinced and agreed to the original 38 foot close encounter. Throughout the obstacles and delays, Collins handled the pressure with amazing calmness. Collins credits her rugged astronaut training for preparing her for adversity. Although her pilot experience helped, NASA stretched her far beyond anything she thought possible. She recounted in Ad Astra, "20% of our basic astronaut training takes us through land and water survival, parachute training, field trips to all the NASA centers, and geology field trips. … About 70% of our basic course concerns learning the space shuttle [and] another part is called enrichment training where we learn a little bit about everything—oceanography, the history of the space program, astronomy, orbital mechanics, weather, medicine—all taught at various intervals to give us a feel for the big picture." Collins later noted that the simulator was one of the hardest parts of her training. During an eight-minute artificial launch, trainers input up to 20 different malfunctions. She remarked in Ad Astra, "You have to prioritize and organize quickly: What's wrong? How to fix it? Find the procedure, then do the procedure. Then you get interrupted with another malfunction. Then you have to decide which one will 'kill me' now, in ten seconds, or in minutes." As hard as training is in the 1990s, it was much more barbaric 30 years before. Concerning the training of the 1960s, the Irish Times wrote, "[The astronauts later claimed] the physical and psychological tests were devised by a sadist. … [They] rode exercise bikes to exhaustion, swallowed a meter-long rubber hose, drank radioactive water and were prodded, tilted, and spun until they couldn't stand." Such tests were given to the women who were almost the first female astronauts and who share a special relationship with Collins. Known as FLATS (fellow lady astronaut trainees), the 26 women were tested in 1961 along with male astronauts. Thirteen of them passed, becoming known as the Mercury 13. NASA, however, canceled the project before the women ever soared into the galaxy. Sarah Ratley, one of the Mercury 13, told the Kansas City Star after Collins's takeoff, "We all knew Eileen and just kind of felt like we were there going up with her saying, 'Go, go, go.' It was a feeling as if we had finally made it." In April of 1994, the FLATS had an official gathering, to which they had invited Collins. She returned the favor by offering the 11 surviving women special seats for the Mir launch. Collins told a Cable News Network (CNN) correspondent, "I feel like so many of them have become friends of mine now, and I'm sort of carrying on their dream." She offered to carry with her on the shuttle such mementos as a scarf worn by aviator Amelia Earhart, known for various female "firsts," and a pilot's license signed by Orville Wright for the famed flier Evelyn (Bobbi) Trout in 1924. Everyone gave something except Jerri Truhill, who explained on National Public Radio (NPR), "I told [Collins] she was carrying my dreams, that was all that was necessary." When the space shuttle thundered into the horizon early in the morning on February 4, 1995, some of the onlookers cried. Women have come a long way in the field of aviation and astronautics, and Collins took them one step further. 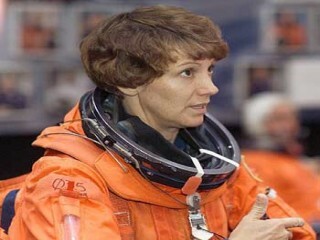 View the full website biography of Eileen Collins.